You’ll want to rake up this theme’s craft, game, workshop, and activity suggestions. Getting dressed routine, word flashcards, leaf models, a bingo game, and many other documents that are perfect for transitioning into autumn. 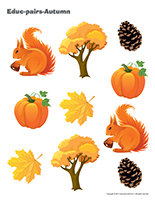 (Open stickers-Autumn) Print the illustrations on adhesive paper and use them to create original stickers for your group. 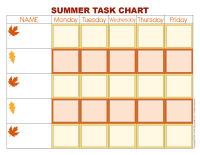 (Open task chart-Autumn) Print and laminate. Display the chart on a wall. Use adhesive putty to add the various tasks you have chosen for your group. Children can add a check next to the tasks as they complete them. (Open educa-theme-Autumn) Print and laminate the different elements representing the theme. Use them to present the theme to your group (and their parents) while decorating your daycare. 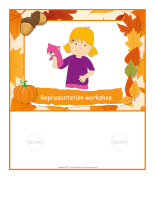 (Open educa-decorate-Autumn) Print, laminate, and cut out the illustrations. Use them to decorate your walls and set the mood for the theme. (Open garland-Autumn) Print and let children decorate the garland elements. Cut out the items and use them to create a garland that can be hung near your daycare entrance or within your daycare. In the back to school theme, we suggested you display a tree trunk on a wall within your daycare to accompany your themes and decorate throughout the year. To decorate your tree for autumn, use a hole-punch to make a hole in several dried leaves and thread them on a long ribbon or string. Hang the leaves on your tree or stick them here and there using adhesive putty. Add construction paper pinecones, acorns, apples, etc. Draw several trees on a long white paper banner or on open brown paper grocery bags. Decorate the trees with your group. Add leaves on the branches and at the bottom of each tree. If you prefer, trace children's hands on orange, red, and yellow construction paper and cut out the shapes to represent leaves. Add construction paper pinecones, acorns, apples, etc. 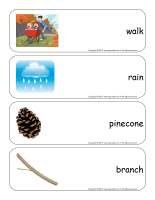 (Open word flashcards-Autumn) Print and display the word flashcards throughout your daycare. During your next visit to a nearby forest, children may recognize different animals and things associated with the theme. (Open weather wheel) Print, laminate, and display within your daycare. Each day, pick a child who will be the group's meteorologist. He will be responsible for the weather wheel. Discuss the day's weather as a group to determine the proper positioning of the arrows. Have your meteorologist place the arrows on the wheel, using both arrows if, for example, it is partly sunny and partly cloudy. Otherwise, both arrows can be placed on the same pictogram. 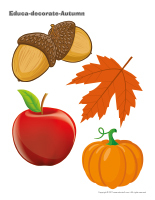 Gather objects corresponding to the various seasons and ask children to associate each one to the correct season. Ask them questions to identify the main characteristics of each season: weather, activities, changes in nature, means of transportation, etc. (Open poster-Seasonal wall) Print. Ask parents to bring you pictures of their child playing outside. Use the pictures to create a special wall. 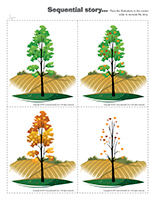 Divide your wall into four sections and use the posters to identify the different seasons. Associate children's pictures to the correct season. Don't miss our autumn calendar (Open visual calendar-Autumn). Print, laminate, and display. (Open picture game-Autumn) Print and laminate the pictures in the format you prefer. Use them to spark a conversation and ask children questions about the theme. What can we see in nature during autumn, for example when we go for walks? Can you name different types of trees? 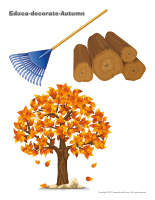 Name characteristics of autumn weather. Is there a lot of rain? wind? sun? What can we use to protect ourselves from the rain? What happens to trees during autumn? What types of clothing do we wear in autumn? Can you name an autumn celebration that children really enjoy? What kind of fruit can we pick during autumn? (Open picture game-Autumn) Print and laminate the pictures in the format you prefer. Use a hole-punch to make a hole in the upper right and left corner of each picture. Stack the pictures and insert a ring through each set of holes. The flipogram is easy to manipulate. Simply show children how they can lift a picture and flip it under the stack. Name each item with your group. Use the flipogram to encourage children to talk during circle time and to ask them questions about the theme. (Open educ-chat-Autumn) Print and laminate the cards. Use the subjects, verbs, and predicates to help children make complete sentences and add to their vocabulary. Arrange the cards in three piles (subjects, verbs, predicates). Ask children to take turns picking one card from each pile and "reading" the sentence. The sentences may be quite silly! If you prefer, place sets of three cards in a row and have children "read" the sentences. Have children draw and cut out autumn pictures. Using clothespins, they can hang them on a clothesline. This activity can be done throughout the theme. This tool was created in response to a special request received. (Open poster-Silence chair) Print and display on the wall closest to the chair children sit on when they need to be silent or, if you prefer, stick it directly on the chair. The pictures may be used as a memory game or to spark a conversation with the group. Use them to decorate the daycare or a specific thematic corner. (Open picture game-Autumn) Print, laminate, and store in a "Ziploc" bag or in your thematic bins. (Open picture game-Autumn) Print the pictures twice and use them for a memory game. (Open educa-spots-Autumn) Print for each child. Use bingo markers to add color inside the circles. If you don't have bingo markers, stickers or cereal can also be used. 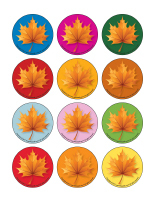 (Open writing activities-A like Autumn) Print for each child or laminate for use with a dry-erase marker. 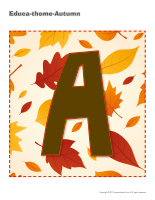 (Open word flashcards-Autumn) (Open giant word flashcards-Autumn) Print several word flashcards. Glue them on pieces of paper, laminate them, and arrange them in a binder. Show children how they can trace the words using dry-erase markers. If you wish, leave room under each word so children can try to write the words without tracing the letters. (Open stationery-Autumn) Print. Use the stationery to communicate with parents, in your writing area, or to identify your thematic bins. (Open educa-nuudles-Autumn) Print for each child. Have children color the sheet and use Magic Nuudles to give it a three-dimensional look. Variation: You don't have Magic Nuudles? Have children fill the spaces designed for Magic Nuudles with bingo markers or stickers. To order Magic Nuudles. (Open posters-Autumn workshops) Print, laminate, and display to identify your various workshops. (Open workshop planning booklet-Autumn) Print, laminate, and use the grid with a dry-erase marker. This essential tool will help you prepare and create the material you need for your various workshops, organize your environment, and plan per the interests of the children in your group. It will also help you analyze your weekly activities. (Open workshop follow-up booklet-Autumn) Print for each child. This booklet will help you better understand how workshops foster children's development. Add a small bin of real or fabric leaves. Children will use them to add to their constructions. 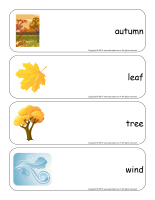 (Open word flashcards-Autumn) (Open giant word flashcards-Autumn) Print and laminate the word flashcards. Have each child pick a word and present it to the group (ex. pinecone). Ask them questions to see what they know about the theme. (Open word flashcards-Autumn) (Open giant word flashcards-Autumn) Print many copies of the word flashcards and encourage children to use scrabble tiles to write the words. Manipulating the small tiles represents a great fine motor skill exercise. At the same time, children will notice which letters make up the different words. (Open word flashcards-Autumn) (Open giant word flashcards-Autumn) Print two copies of several different word flashcards. On a large piece of cardboard, stick one copy of each flashcard vertically to create a word column. Cut the second copy of each word flashcard so you have the word on one side and the illustration on the other side. Attach Velcro behind each part as well as to the right of the uncut flashcards (on the cardboard). Arrange the cut flashcards on the table and encourage children to look at your flashcard board to identify a matching word and illustration. When they succeed, they may stick them next to the corresponding flashcard, on your board. This exercise will help children associate words with pictures. (Open word flashcards-Autumn) (Open giant word flashcards-Autumn) Print several word flashcards. Use a hole-punch to make a hole at the top of each flashcard. Thread a ribbon through each hole and tie a knot. Bring the word flashcards outside and encourage children to use them to decorate a tree. Every time a child adds a flashcard, invite him/her to "read" the corresponding word. Children will be happy to repeat this activity many times. Eventually, they will learn to recognize the words. (Open word flashcards-Autumn) (Open giant word flashcards-Autumn) Print two copies of several word flashcards. Hang one copy of each word on an indoor clothesline with colourful clothespins. Arrange the copies in a pile on a table. Let children take turns picking a word and finding the matching word on the clothesline. When they find a match, they can place the flashcard on top of the one that was already hanging on the clothesline. Help younger children manipulate the clothespins if necessary. 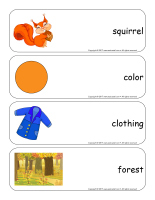 (Open word flashcards-Autumn) (Open giant word flashcards-Autumn) Print several word flashcards and hide them throughout your daycare or yard. Divide your group into two teams. When you give them the signal, children must search for the flashcards for a pre-determined period, for example three minutes. When the time is up, children must be able to "read" their flashcards to earn a point for their team. If they are unable to find the correct word, the other team can earn the point if they succeed. 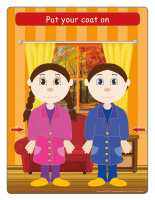 (Open sequential story-Autumn) Print the story, laminate the illustrations and cut them out. Children must place them in the correct order. (Open puppets-Autumn) Print the characters. Have children color them and stick a Popsicle stick behind each one to create fun puppets. If you prefer, use the color version and simply laminate them. (Open felt board-Autumn) Print the items and glue them on felt pieces. Glue four pieces of black felt on a large piece of cardboard to create a felt board and hang it on a wall. The felt items will easily stick to your board. Children will enjoy using them to create a variety of scenes and stories. Plan a special sharing day, the Friday before Thanksgiving. (Open perpetual calendar-Sharing Day-Thanksgiving) Print. Greeting: Invite each child to bring an item that is precious and an object of lesser value to daycare. They will give the item of lesser value to a child in need. Circle time: Invite each child to present their precious item to the group. They can share it with their friends. Encourage each child to present their object of lesser value too, the object they chose to give to a child in need. As a group, visit an organization in your community to give them the items children have chosen to donate. Lunch and snacks: Organize a potluck lunch. Ask each child to bring a dish prepared with their parents' help. One child can bring something for the morning snack, another child can bring something for the afternoon snack, a few children can bring dishes that can be served for lunch, and finally, a child can provide dessert. Ask parents what works best for them. Special activities: Divide your group into pairs for the day. Encourage each pair to share everything throughout the day to give them the opportunity to experience the joys associated with sharing. Show children how to play "blind man". Blindfold one child from each team and his/her partner must guide him. Organize a plastic bottle drive. Return the bottles you collect to your local corner store and donate the money received to a local organization. Encourage families to donate clothing items they no longer use (or no longer fit) to a shelter or the Salvation Army. (Open game-This is my spot-Autumn) Print each illustration twice. Use adhesive paper to secure one copy of each illustration on the table. Deposit the second copy of each illustration in an opaque bag and invite children to pick a card that will determine their spot at the table (corresponding illustration). The illustrations can also be used to determine children's naptime spots or their place in the task train. 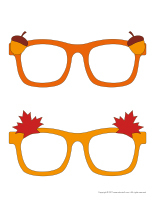 Glue a leaf or an apple on each chair at the table, making sure you have a copy of each one on hand. 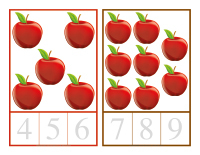 At lunch or snack time, invite children to come pick a leaf or an apple to determine where they shall sit (corresponding number). Arrange construction paper leaves on the floor. Invite children to hop on the leaves in a variety of different ways: on one foot, on two feet, backwards, etc. Each hop will help them work on their gross motor skills. Use adhesive tape to draw a large hopscotch grid on the floor within your daycare. You may, for example, use it to connect two areas. Show children how they must alternate hops on one foot and on two feet. 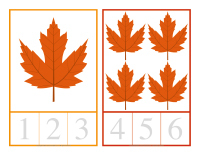 Draw an autumn-related item in each square. 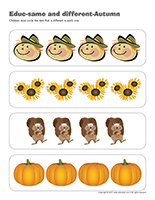 (Open my autumn path) Print, laminate, and arrange the illustrations on the floor to create a path leading to various areas within your daycare. The path can lead to areas frequently visited by children throughout the day such as the bathroom, the cloakroom, etc. or, if you prefer, delimit your workshops. (Open getting dressed routine-Autumn) Print, laminate, and display in your cloakroom. Fill a large bag with leaves and dump them on the floor, in the centre of your daycare or, if you prefer, in a kiddie pool. Let children hide in the leaves, toss them up in the air, and manipulate them. Give children who may be tempted to put the leaves in their mouth their pacifier. Fill clear plastic bottles with items that can be associated with autumn such as red, orange, and yellow beads, dirt (or instant coffee), raffia, leaf-shaped confetti, etc. Children love jumping in large piles of leaves. This is a simple outdoor activity. 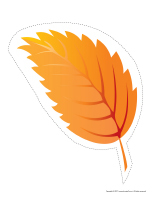 For variety, why not bring leaves into the daycare and create your very own leaf storm. You will have a hefty cleanup job, but oh what fun! Use adhesive tape to determine a start and finish line. Place two leaves 10 cm apart. Provide children with straws or empty toilet paper rolls they can use to blow on the leaves to move them towards the finish line. The first child to successfully cross his leaf over the finish line wins. The winner may try again with another child. Go for a walk in a nearby forest with your group. Name the things you see (squirrel, bird, pinecone, etc.). Encourage children to touch leaves, pine needles, etc. Replace the balls in your ball pit with fabric leaves. Children will have a lot of fun manipulating the colourful leaves. Variation: You may also fill your ball pit with leaves that have fallen to the ground. Hang a large piece of adhesive paper on a wall, with the sticky side facing you. Let children press leaves on the paper. (Open lacing-Autumn) Print, laminate, and punch holes around the contour of each shape. Children can thread string, a shoelace, or ribbon through the holes. (Open lacing-Leaves) Print, laminate, and punch holes around the contour of each shape. Children can thread string, a shoelace, or ribbon through the holes. With your group, pretend you are tiny leaves being blown around by the wind. Vary the force of the wind. Encourage children to move slowly when there is just a breeze. They can move fast when the wind picks up and spin around very quickly when the wind is violent. Cut leaf shapes out of tissue paper. Give each child a drinking straw. Have them use their straw to transport the leaves. Show them how they can draw air up through their straw to get the tissue paper leaves to stick to the tip of their straw. Set a pile of clothes at one end of your daycare. When you give the signal, children must run to the pile, choose a clothing item, put it on, and run back to the start. This is a great way to help children learn to dress themselves. For items with buttons or zippers, children can simply do the best they can to fasten them. Variation: Your pile of clothing could include items for different seasons. Name a season and have children pick an item that is appropriate. If the item they select is not appropriate for the season you named, have them go back to the pile to pick another one. Variation 2: Use a timer (or simply play a song). Have children run to the pile and race to get completely dressed before the timer goes off. For example, you may ask older children to find a coat, a hat, a scarf, boots, and mittens to wear. Fill a kiddie pool or several plastic bins with leaves. Hide different items among the leaves. When you give the signal, children search for the items. Every time they find one, they must set it in a special spot that will represent a cache, just like the ones used by squirrels. Fill a large bag with leaves and dump them on the ground or, if you prefer, in a kiddie pool. Let children hide in the leaves, toss them up in the air, and manipulate them. Give children who may be tempted to put the leaves in their mouth their pacifier. Have children build a bed of leaves. They will look forward to relaxing on their bed. Invite them to observe the clouds and look for shapes. They can draw them later in the day. Listen to the wind and the birds. Relax! Hide several different types of leaves throughout your yard. Have children search for them. 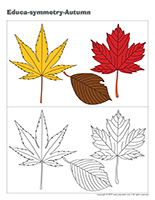 This activity can be used to associate leaves with different types of trees. Set several leaves on your parachute. Invite children to gently raise and lower your parachute to make the leaves bounce up and down. Gradually have them increase the speed at which they move the parachute until they send the leaves flying. Set an autumn-coloured sheet of construction paper in each corner of your daycare (yellow, orange, red, green). To the sound of music, encourage children to dance around the daycare. When the music stops, name a color. Children must rush to sit in the corner with the corresponding color. 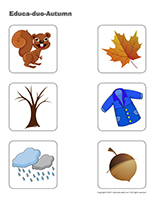 (Open word flashcards-Autumn) (Open giant word flashcards-Autumn) Print and laminate the flashcards. Deposit them in an opaque bag and use them for a mime game. Children take turns picking a word and miming it so the other children can identify the correct word. For example, if a child picks the word "squirrel", he/she can pretend to have food in his cheeks. (Open photo booth-Autumn) Print the various accessories, cut them out, and glue a drinking straw behind each one. Purchase hats, scarves, glasses, etc. at your local dollar store. Create an autumn décor using a large piece of cardboard or curtain. Invite children to pick the accessories they prefer and pose for you. You can take individual, group, or family photos. Print the pictures and display them on a wall for everyone to see. Give children flashlights. Turn off the lights and close the curtains to make the daycare as obscure as possible. Hang autumn images throughout the daycare. Children move about, observing the images you left with their flashlights. Set several objects in a box. Blindfold a child. Ask him to pick an object out of the box and name it. Once he has named it, remove the blindfold and let him discover if he guessed correctly or not. Return the object to the box and blindfold another child and so on. Use four pieces of black felt. Glue them onto a large piece of cardboard and hang it on the wall. With your group, cut shapes out of coloured felt. The shapes will stick to the black felt. Children will love creating autumn scenes. Prepare new shapes when you begin a new season or a new theme. 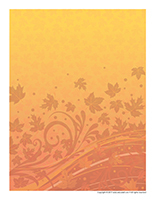 You may use the shapes we have prepared for this theme (Open shapes-Autumn stencils). They can be used for cutting or drawing. 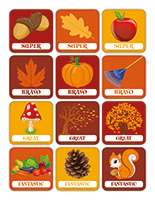 (Open counting cards-Autumn) Print and laminate. Prepare a series of wooden clothespins on which you can paint or draw numbers 1 to 9. Children count the items on each card and place the corresponding clothespin on the correct number. (Educa-symmetry-Autumn) Print. Children must color the picture on the bottom to make it look exactly like the picture on the top. (Open roll and color-Autumn) Print for each child. This game can be enjoyed individually or as a group. Children take turns rolling a die, counting the dots, and coloring the corresponding part. (Open educ-trace-Autumn) Print for each child. Children must trace the lines using a crayon of the designated color and then color the item at the end of each line with the corresponding color. 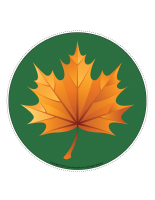 (Open educ-same and different-Autumn) Print and laminate for durable, eco-friendly use. Children must circle the illustration that is different in each row. 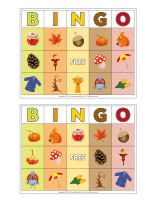 (Open bingo-Autumn) Print and play bingo with your group. Invite parents and grandparents to join you to celebrate autumn. Store the cards and pieces in a Ziploc bag. 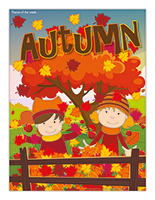 (Open educ-big and small-Autumn) Print and laminate the game. Children must determine the correct order for each set of cards, from the smallest to the biggest item, and arrange them in the squares using Velcro or adhesive putty. (Open educ-math-Autumn) Print and laminate for durable, eco-friendly use. Children must count the items in each rectangle and circle the correct number. (Open educa-duo-Autumn) Print and laminate for durable, eco-friendly use. Children must draw a line between items that go together using a dry-erase marker. (Open color by number-Autumn) Children must color the picture per the color code. (Open educ-pairs-Autumn) Print. Children must draw a line between identical items or color them using the same color. For durable, eco-friendly use, laminate and use dry-erase markers. (Open association game-Seasons) Print and laminate. 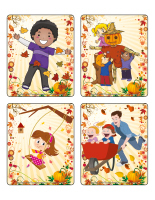 Stick Velcro behind each card and have children associate them with the correct season. Red squirrels build their nest among branches or cavities in trees. In winter, they eat food stored in caches during late summer and autumn. A single cache can contain several hundred pinecones. Go on a nature walk with children. Give them each an empty tissue box which can be used to store their findings. Encourage them to collect branches, pinecones, acorns, etc. The items in their caches may be used for the theme's many crafts. (Open my first herbarium) Print for each child. Throughout the theme (or season), children collect flowers and leaves they can add to their herbarium. Write the date under each new addition and help children identify the items they find. With younger children, print a single herbarium and have them complete it as a group. Prepare red, green, orange, and brown booklets. Throughout the theme, children add pictures of the corresponding colour to each booklet. The red booklet can be filled with red objects such as an apple. Leaves are perfect for the green booklet. This is a great exercise for colour recognition. You will need a bin filled with water or a water table. Add leaves. Children use straws to blow on the leaves to make them move about. Use three empty storage bins. On each bin, glue a different coloured leaf (green, red, and brown for example). Place a large bag of leaves next to the bins. Children sort the leaves per their color. Go for a walk with your group and collect pinecones. Glue a string to each pinecone and let children use a plastic knife to spread peanut butter all over them. Hang them in a tree (beware of allergies). 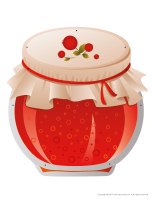 Prepare autumn Jell-O for snack time or to fill a sensory bin. Use red, orange, yellow, and green flavours. Serve store-bought maple leaf cookies at snack time for a special autumn-themed treat. 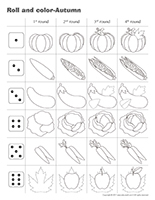 (Open educ-poster-pumpkin) Print and laminate the document to introduce children to this food item. Display it in your kitchen area. 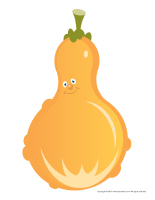 (Open educ-poster-squash) Print and laminate the document to introduce children to this food item. Display it in your kitchen area. v Print the various models on cardboard. Ask children to cut them out and decorate them with arts & crafts materials. Glue a Popsicle stick behind each one to complete the puppets. (Open models-Autumn) Print the models and use them for your various projects and needs throughout the theme. (Open mandalas-Autumn) Print for each child. Encourage children to color the mandalas to help them relax. (Open stencils-Autumn) Print and cut out the various stencils. Children can use them to trace and paint summer items throughout the theme. (Open leaf mobile) Print. Have children color the leaves and decorate them as they wish. Cut them out and use string to hang them from a clothing hanger or use the number eight model provided as a support. 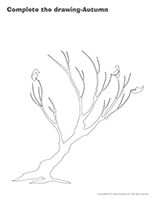 (Open model-Tree without leaves) Have children color the tree trunk. 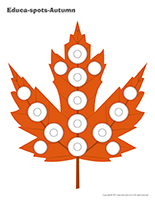 Using autumn-coloured finger paint (red, orange, yellow, green), children use their index finger to add small dots to represent leaves on the branches. Have children glue leaves collected outdoors on a piece of cardboard. If possible, collect natural leaves. If not, use leaves from leaf garlands available at dollar stores. Next, laminate the placemats on both sides using adhesive paper. Children may use their placemats at daycare or take them home. Collect elements of nature you can dip in autumn-coloured paint to make beautiful prints. Trace a tree trunk with four (4) branches on construction paper. Have children fill the tree trunk with crumpled pieces of brown tissue paper. Make tiny balls of red, yellow, orange, and green tissue paper to add leaves to the tree. Pull the husks and silk off ears of corn. Do not remove the stems. These can be used to give the pals a haircut or be tied with string. Children add details to their pal. Eyes, a nose, and a mouth can be added using paint, pieces of felt, craft foam, or markers. Ask parents to provide old hats or purchase some in thrift shops. Using elements of nature, children decorate their "autumn hats". Organize a parade around your neighbourhood. Use musical instruments and celebrate autumn! Create a scarecrow with your group. Together, prepare a list of everything you need. Have each child provide one item. Stuff your scarecrow with leaves and set it near your entrance. Use a pumpkin or a plastic bag filled with leaves for the head. Name your scarecrow. He can guard your door until Halloween! Have children pick a leaf and paint one side (the side with veins) using different colors. Once this is done, have them set the leaf on a piece of cardboard (painted side down) and gently tap it with a plastic hammer or a flat-bottomed pot to create a leaf print on the cardboard. Remove the leaf and admire the result. Have children pick a pretty leaf. Let them glue wiggly eyes on it. 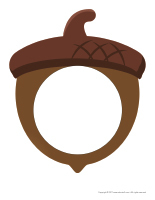 They can stick a pompom on it to represent a nose and use a small branch for a mouth. Have children press corn or different types of squash in paint and let them roll them on a large piece of white paper or cardboard. Observe the different designs and watch the colors mix together. (Open leaf models) Print. Let children decorate the leaves as they wish. 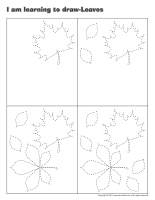 When they are done, have them glue them on a large piece of paper to represent a leaf storm. Variation: If you wish, they may add pumpkin seeds or pieces of dried leaves to their collage. With your group, stick several leaves on a large piece of paper. Provide sponges children can use to completely cover the leaves with paint. Once the paint is almost dry, gently remove the leaves. Variation: Use old toothbrushes instead of sponges. Hang a large piece of white paper on a wall. Draw a tree trunk on it and invite children to stick real leaves (collected during your daily walks) all over its branches. Cut a leaf shape out of adhesive paper and have children stick pieces of autumn-coloured tissue paper, seasonal confetti, or other autumn-related items all over it. When you go for walks with your group, collect items found in nature. When you return to daycare, let children stick the items they found on a large piece of paper. 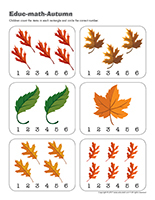 Trace each child's hand on a piece of colourful construction paper to represent leaves. Have children cut them out and stick them on a giant tree trunk displayed on a wall. 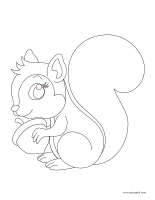 (Open coloring pages theme-Autumn) Print for each child. (Open complete the drawing-Autumn) Print for each child. Children must draw the missing items. (Open I am learning to draw-Leaves) Print and laminate the model sheet. Invite children to practice their drawing technique on the model sheet before attempting to draw a leaf on their own. 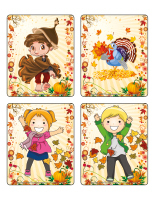 (Open creative coloring-Autumn) Print for each child. Have children complete the drawing as they see fit. Wear your coat, now that's a rule!